The Office of Admission and Global Marketing and Communications have launched a virtual campus tour in conjunction with YouVisit. The tour offers a highly engaging and interactive virtual reality experience that is expected to generate prospective student interest and increase conversion rates. This tool serves as a supplement to in-person, individualized campus visits and offers an additional resource for prospective students who cannot personally visit campus for any reason. Faculty and staff are encouraged to view the tour and share where appropriate. A virtual tour banner is also posted at the top of the webster.edu home page. 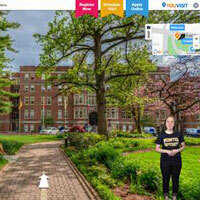 YouVisit's photographer captured scenes from all over campus for the virtual tour..